Wouldn't it be awesome to easily see which of your "Want to Read" Goodreads books are currently available at your library? Or, perhaps, you're searching on Amazon for that title that you keep hearing about, and, after reading all of the reviews, you want to instantly find out if your library has a copy? One of my favorite Chrome extensions is the "Library Extension" by Andrew Abrahamowicz. It is free and available to all libraries! If your library isn't on the list (there are over 1200 on it at the moment), you can request it via his website and he'll add it within a few days! 1. 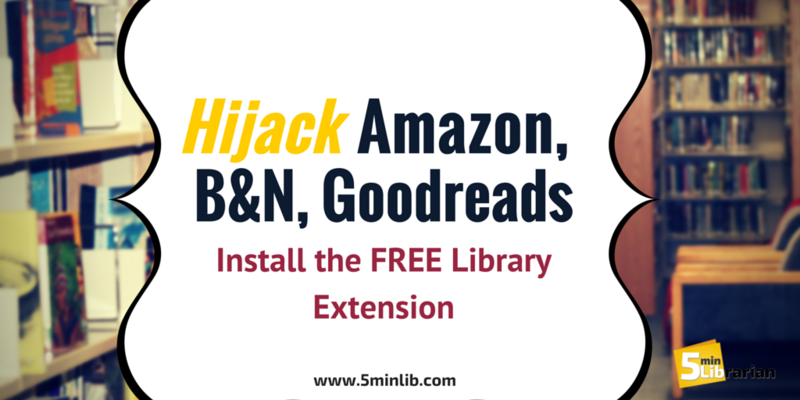 The extension connects your library's catalog to sites like Amazon, Barnes & Noble and Goodreads. So, when you are viewing a book or ebook, you can easily see if it is also available at your library. For Amazon and Barnes & Noble, the extension appears on the right. In Goodreads, it appears in the middle, under the editions. 2. It is so convenient to use! You just click the "borrow" button and it brings you to your library's catalog, directly to the book you wanted. 3. It allows you to harness the great browsing and searching power of Amazon and Goodreads, but easily see availability from your library's catalog. I've also used it to make sure my collection has the top rated books, quickly finding what I was missing and then ordering. It can also be helpful when developing Reader's Advisory lists. 4. You can connect to as many libraries and consortiums as you want. They quickly add new libraries when requested (usually within 24 hours) and fix any bugs that you come across (from books being linked incorrectly to books not showing up when they are indeed available). This is impressive work from a free extension! They do want to know of any problems, so please let them know. This extension connects your library's catalog to these sites. They use the title and author for matches between the two catalogs, so sometimes (since we all know how great our library catalog works), it may not work properly. But in my experience, the bugs have been few and far between. They do search for ebooks, too, but they are currently only able to do that for OverDrive, so if you don't have an option for ebooks for your library, that's probably the reason why. For those of you concerned about privacy, they DO NOT track your browsing history. This extension only works for Chrome right now, but they are working on a Firefox extension. You can sign-up to be notified of when it is available. Unfortunately, they do not include audio books, CDs, or video games. They do plan to offer a premium version in the future, and I hope they include this option in that package. Currently, they do not make any revenue off of this extension (which makes their fabulous customer service all that more impressive!). We cannot convey how much we love this extension and what Abrahamowicz has created -- and for free! One of the hardest jobs for libraries to do is be part of patrons' every day lives. This extension allows us to be integrated onto the sites that our patrons are visiting more than our own catalog. So valuable for everyone in many ways. Definitely worth five minutes checking it out and seeing how it works. It might even be worth an extra minute telling other librarians and patrons.